Secreted away beneath the floor of an English cathedral was a large calfskin canvas featuring what, at first glance, appeared to be a map of the world. Once recovered and repaired, the map was found to date to 1285. While a myriad of cities and towns are depicted on the medieval Mappa Mundi, more than 500 ink drawings illustrate biblical events, exotic plants and animals, wild and strange creatures, and classical myths. 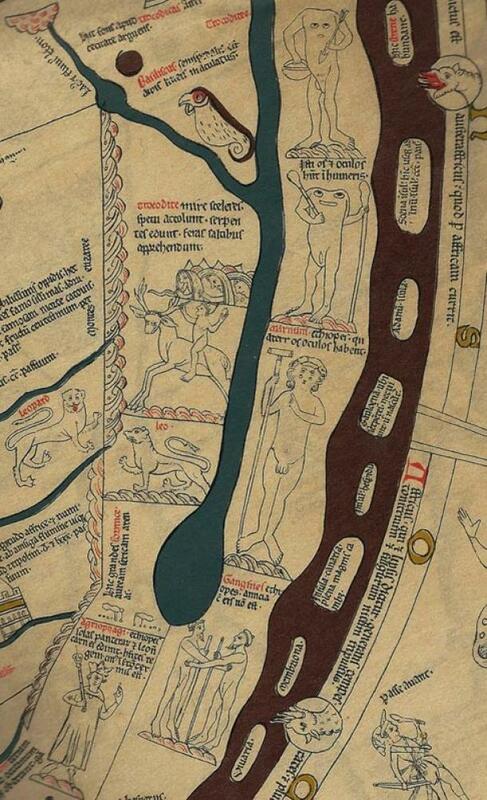 More than just a map, the “Cloth of the World” remains one of the greatest surviving artworks of the Middle Ages. Known as the Hereford Mappa Mundi, medieval artwork showcasing history, religion, and mythology is depicted in intricate detail on a single sheet of vellum, or preserved calfskin. The skin stretches five feet high by four feet across, and is attached to an oak frame. 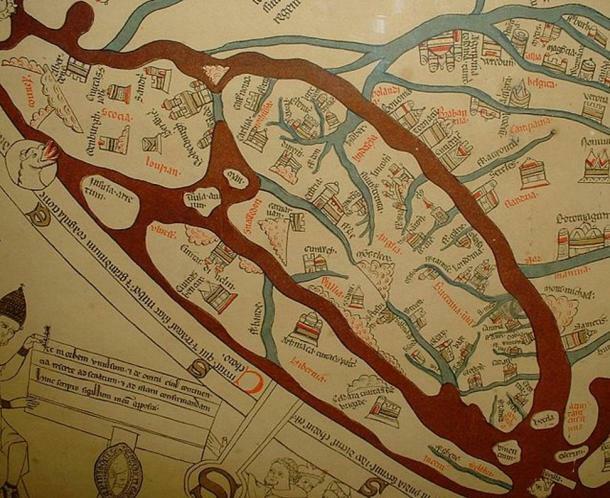 The remarkable artifact remains the largest medieval map still known to exist. The tangled ink illustrations of black, gold, green and blue, reflect a medieval European understanding of the known world at the time—and also the unknown world of the supernatural— highlighting not just the human world of men, cities and seas, but entire bestiaries of horrifying mythical creatures and the strange cultures of distant lands. It was not for use as a navigational tool, but instead was an artistic compendium of people, parables, and places. Most obvious is the cartography of the Mappa Mundi. East is found at the top of the map, as this orientation represented the rising of the sun and the second coming of the Christ. The world is laid out in a circle, and because of its Christian framework, Jerusalem sits at its center, a common theme in medieval mapmaking. At the very middle of the map a small hole has been pierced where a compass-like instrument was used to create a perfect circle which became an image of a fortified wall with eight towers. Continents included are Asia, Africa, Europe and the Mediterranean. Approximately 420 towns and cities of the day are represented on the map, such as Rome and Paris (and Hereford), as well as oceans and important landmarks. Eight classical legends are included on the elaborate map. The Golden Fleece as quested for by Jason and the Argonauts is found drawn on the coast of the Black Sea. The Cretan Labyrinth which bound the mythical Minotaur is depicted on the vellum. It was a recognizable symbol in the Middle Ages, as labyrinths were laid out on floor paving of cathedrals. These winding pathways acted as spiritual pilgrimages for the faithful. In classical myth, the Columns of Hercules represented the western edge of the known inhabited world. This is marked on the Mappa Mundi at the Strait of Gibraltar. Even the camp of Alexander the Great is illustrated on the map. Legends of the deeds and successes of the heroic leader were popular with scholars at the time. Alexander’s camp is shown as many tall tents, and a strong wall runs along his camp, which Alexander was thought to have built to repel and imprison the “destructive evil of the Sons of Cain.” The area below this is attributed to the “Scythian races”, and as knowledge of this region was limited, the area is decorated with dramatic and wild images. Jesus is found at the very top of the map, highlighting his significance and importance in the Christian faith. Along his right, people travel from death into heaven, and on his left, the damned are chained and dragged off to Hell, represented by a beast’s gaping maw, including sharp teeth and glaring eyes. 15 bible stories are illustrated on the Mappa Mundi. The Garden of Eden, including Adam, a serpent, and Eve, is found near the top. Eden is surrounded by a ring of fire, signifying that it is off limits to humanity. A boat filled with creatures and a bearded man represents the tale of Noah’s Ark. The largest building on the map is the five-story city of Babylon. The topmost structure is labelled the “Tower of Babel.” The sheer size of the elaborate drawing, as well as the details of the text on the map, emphasize the arrogance and pride of the people who were said to build a tower so high that it might challenge god. In the biblical legend, God’s punishment ultimately caused humanity to speak in different languages. On the map a long, curving line cuts a path through a red-ink Red Sea, depicting the travel route of the Israelites in the story of Exodus. 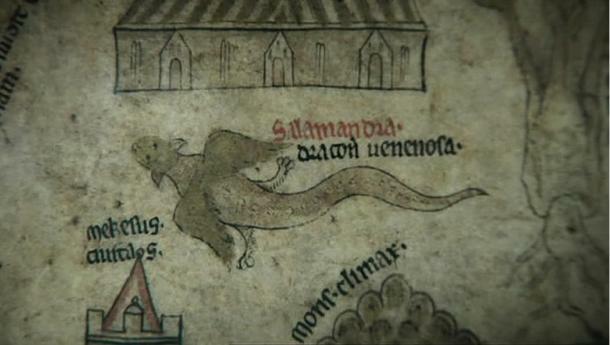 Many natural and unnatural creatures abound on the Hereford Mappa Mundi. Animals less well-known to medieval Europeans, such as camels or elephants, were drawn with some success on the map. A camel with two humps is located south of the Memarnau Mountains. Bestiaries (books of beasts) of the time described camels as living for one hundred years, and being only able to drink muddy water. Elephants are drawn wearing constructed wooden towers, as the large animals were fitted with these fighting platforms for use in warfare by Indian and Persian soldiers. It was believed even then that elephants fear mice. 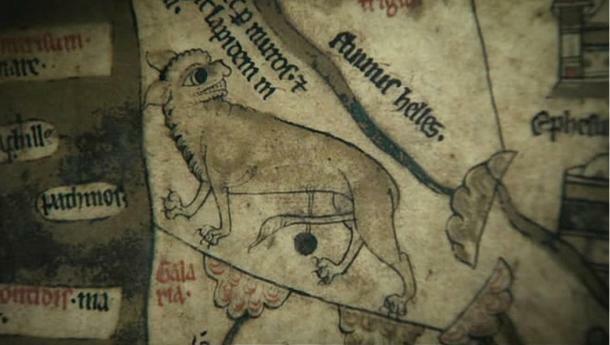 The legendary unicorn is depicted on the map, with a single, long horn. Named Monoceros, the unicorn was often linked to Jesus. It was reputed to be strong enough to battle elephants, but could be tamed by innocent and virtuous young women. 33 different animals, exotic plants and birds are described in ink on the Mappa Mundi. Various strange and wonderful people are represented on the map, both real and unreal. 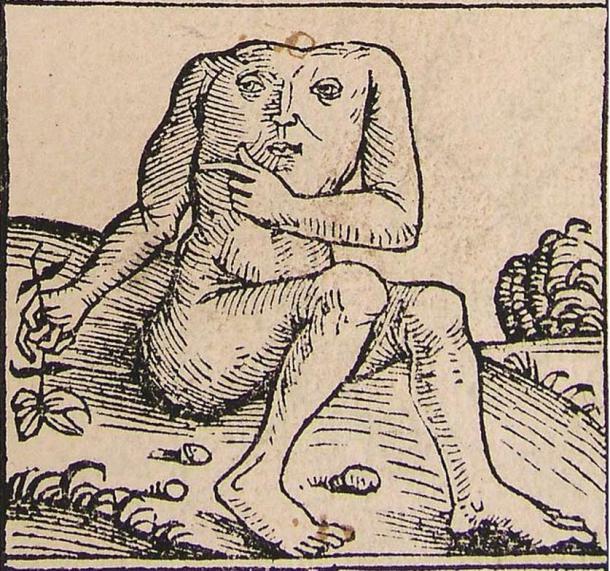 Likely due to exaggerated traveler tales of dangerous foreign cultures, 32 images include outrageous people, such as the Blemmye; a war-like race of people with no heads, and with facial features in their chests. Sciapods, or Monoculi, are found on the map. Tales of these scary beings with a giant, single foot included theories on how they were able to move quickly on their one leg. 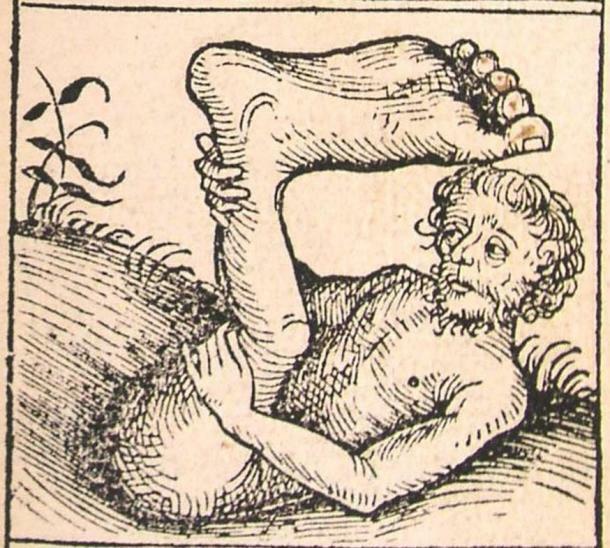 They were believed to use their large foot to shield themselves from the sun. Mysterious and dangerous cave dwellers, or Troglodytes, are drawn in Africa on the map. Three of these men are depicted in caves, and one rides a strange goat beast. They appear to eat snakes and run around naked. The map text describes Troglodytes as very swift men who catch wild animals by jumping onto their backs. Troglodytae were an ancient group of people from the African Red Sea coast as described by Greek and Roman historians, including Herodotus, Strabo and Pliny. These anecdotes eventually turned into mythical feats and wild characteristics. To whom joy in heaven be granted. The map was hidden away during times of political uncertainty and war, languishing under floorboards and forgotten in secret locations, until 1855 when it was cleaned and repaired at the British Museum. It now sits in a glass case on display at a new library in Hereford. The Hereford Mappa Mundi has survived 700 years, preserving and illustrating the beliefs, knowledge and traditions of medieval Europe. It remains one of the most significant historical maps in the world. 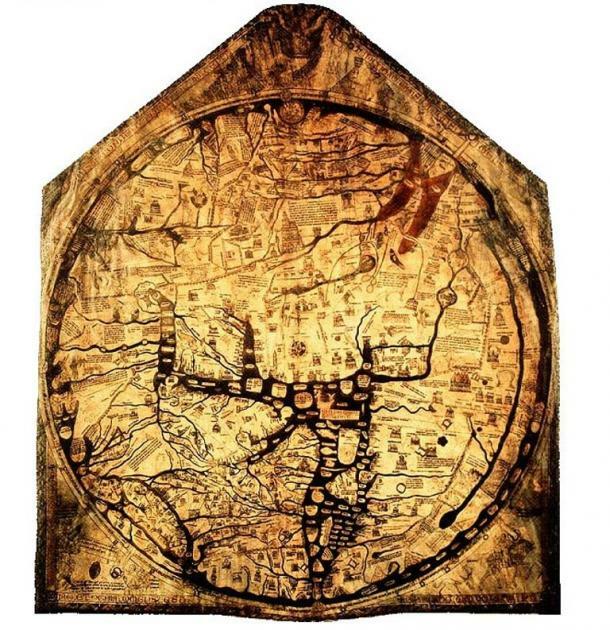 The Mappa Mundi Hereford Cathedral website has an interactive map available here, illuminating some of the countless images found in the medieval artwork.